Kids Gummies : Omega 3, 6, 9, and DHA Essential Fatty Acids are just what you need to improve and facilitate the overall health and well-being of your most prized positions, your kids! This gummy provides 2 types of omegas that kids cannot manufacture (and are critical to a kid's health). Omega-3 fatty acids & DHA are essential for brain development, heart health, skin health, and eye health. Our Gluten Free, Vegetarian Formula has delicious lemon and lime flavor and is formulated for kids 2 years and older. Deficiencies in essential fatty acids needed by a growing child's brain could result in poor learning and reading abilities, as well as their attention spans. Our brains are made up of 25 percent or more DHA. Essential Fatty Acids also support your central nervous and help to manufacture a fluid call myelin. Myelin is a layered material composed of phospholipid, cholesterol and protein that winds around nerve cell axons. Myelin insulates nerve impulses from neighboring nerve fibers, and it increases the speed of impulses through nerve axons. Essential Fatty Acids & DHA are essential part of your children's health and it's not something your body produces, your kids need to get it from somewhere. 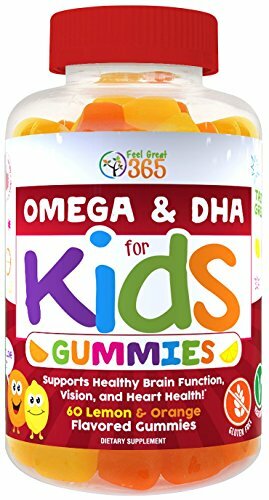 Feel Great 365 Gummies contain the daily required dosage of DHA and Omegas needed by your kids to get and remain healthy on a daily basis. BOOST YOUR KIDS OMEGAS: If you're like most parents, you simply cannot get your kids to eat enough fruits and vegetables with omegas. Now you can take one serving of Omega3 DHA for KIDS, and get them the nutrition they need to be in order to stay healthy. Vegan! GET TO OPTIMAL HEALTH: According to food nutrition, your kids needs such a wide range of fruits, veggies, vitamins, minerals, natural fibers, enzymes, omegas and probiotics in order to grow and be healthy, it's no wonder you can't give it everything in the course of their daily diet. Now they can get all the omegas & DHA needed to keep their brains healthy and growing. TASTE GREAT: Unlike most omegas for kids you'll see, this one was is in a delicious chewable format. Have you ever tried to get kids to take fish oil? yuck! These taste great! MANUFACTURED RIGHT HERE IN OUR PREMIER cGMP FACILITY: Many people are understandably skeptical when it turns out their Gummies were manufactured in countries which may not employ stringent standards when it comes to manufacturing processes. We manufacture all our superfoods right here in the USA in our GMP-certified facility (registered with the FDA). This ensures you get the amazing vegan DHA you're expecting in every serving. GUARANTEE THE GOODNESS: At Feel Great 365, we guarantee all our Gummy supplements for freshness, quality and effectiveness. If you're unhappy for any reason with your DHA Gummies for Kids, just let us know and we'll immediately send your refund or replacement. No questions asked. If you have any questions about this product by Feel Great 365, contact us by completing and submitting the form below. If you are looking for a specif part number, please include it with your message.